However hard I tried I've failed to get the exact meaning of tending his spinning wheel here. It would be argued, and indeed I would argue, that Muslim intransigence would have played a destrucitve role in any case. But the task of persuading ordinary Muslims to leave Congress and to join with the partitionist “Muslim League” was made much easier by Gandhi’s talk of Hinduism and by the long ostentatious hours he spent in cultish practices and in tending his spinning wheel. This wheel—which still appears as the symbol on the Indian flag—was the emblem of Gandhi’s rejection of modernity. He took to dressing in rags of his own manufacture, and sandals, and to carry- ing a staff, and expressing hostility to machinery and technology. I gave the previous and following sentences for a full understanding of the meaning. It mentions the wheel in question in the following sentence and I get it is the actual wheel with the usual sense of the word. What I wonder is if there is a connotation here which would mean something like "Gandhi cares for his own interests, no matter what"? I'm asking this because we have the same phrase in my native language with the above meaning. Or, are there any other possible implied meanings -positive or negative- which I fail to see? The task of persuading ordinary Muslims to leave Congress was made much easier by the long ostentatious hours he spent in tending his spinning wheel. The implied (negative) meaning is that Gandhi's talk of Hinduism, his cultish practices and his giving a lot of attention to his spinning wheel lead to the departure of Muslims from Congress to join the partitionist Muslim League. 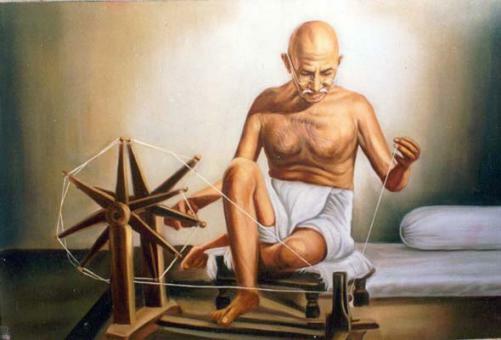 The spinning wheel, or 'charkha', was used by Mahatma Gandhi to weave his own fabric. Any resemblence of the expression to any idiom in your native language is sheer coincidence. PS - His aim wasn't to promote Hinduism, but to boycott foreign clothes; which was in the interest of the poor people working in the Indian clothing industry. I always took it to mean that he "practiced what he preached." Not the answer you're looking for? Browse other questions tagged meaning phrases expressions meaning-in-context idiom-meaning or ask your own question. What does “creeping on one's turf” mean? What exactly does “tally ho” mean? What does the phrase to have one's clock wiped mean? What does “base passions” mean? What does “in one's hand” mean in this case? What does 'lay one's shoulder to ' mean? What does “bc same” mean?